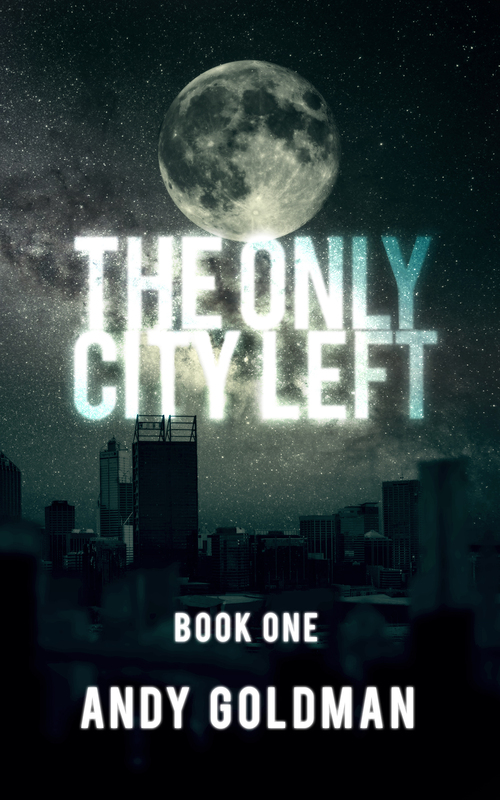 The Only City Left is now available on Amazon! Lithicbee.com is no longer my primary web site. Please visit atgoldman.com for up-to-date news. The Only City Left Is Here! Welcome to my serial science-fiction/fantasy adventure, The Only City Left. This is the story of Allin Arcady and his adventures through a dying, planet-sized city called Earth. If you are new to The Only City Left and want a quick catch-up, you can read a synopsis of Parts 1-34. You can reach an individual part of the story by browsing the Table of Contents. At the end of Part 34, Allin and Tumble’s peaceful meal was interrupted by the arrival of a gang of filthy, murderous thieves. Tumble told Allin he would handle them. I stood with my back against the corridor wall. Tumble, concealed beneath his broad leaf hat and poncho, stood before me in the center of the corridor, looking straight ahead at the far wall. The men on either side stood about ten feet away, and in the face of Tumble’s calm and quiet manner, their laughter died away. How strange he must have looked to them, standing only as tall as a child but with the confidence of a warrior. If they thought he was a child, though, they didn’t let that stop them from attacking. Beak-nose led the charge and as a result was the first to experience the wonder of flight. I didn’t even see how Tumble did it, but one moment the bandit leader was running at him, sword held high, and the next he was hurtling past him, straight into one of his oncoming friends. The only sign that Tumble had moved was that he was now facing me. So that’s what it’s like to be one with the universe, I thought before the remaining half-dozen men still standing reached us. I ducked a swing from one assailant, and when his sword smashed into the wall where my head had been, it snapped in two, the end flying away to clatter on the hard floor. I looked up at my would-be murderer and saw him staring at the stump of his weapon in a daze, like he had just broken his favorite toy. Maybe he had, but I didn’t feel bad for him. Instead I sprung back up and punched him in the face. Or I would have if his face had still been there. Instead, he fell backwards with a sudden whoop, letting go of the other half of his broken sword in the process. My punch carried me forward and I might have fallen over if not for someone giving my legs a forceful push back. I looked down and saw that it was Tumble, who had one foot underneath the fallen man’s leg. “He tried to kill me!” I protested, but Tumble had already moved back into the fray. He must have taken another man down before coming to my rescue, because only four remained standing. “Observe your opponents,” Tumble said, his voice raised over the shouts and curses of the men who now circled him. One lunged at him with a dagger, but rather than leap away, Tumble stepped toward him. With a whoosh of his poncho, he twirled around and ran his hands along the thug’s arm until they settled on his wrist. Before the poor fool could react, Tumble bent his wrist and pulled him off-balance. The thug screamed in pain and practically flipped himself over with only minimal assistance from Tumble. He landed on his back with a thud and a whimper, and when Tumble released his wrist, his arm fell limply to the floor. He let go of the knife and Tumble kicked it away. “Accept the ki your opponents offer,” Tumble lectured, as calmly as if he were leading a class of kittens, not fighting for his life. Another bandit rushed him, apparently not paying attention to the lesson. “And then return it to them,” he continued, redirecting the bandit into the wall opposite me. The last two men standing took up position across from each other. I kept one eye on them and the other on their fallen comrades, although none of them appeared to be in a rush to face Tumble again. He leaped gracefully out of the way of an attack from behind him. “It cries out, ‘This is how I will move next. Dance with me!’” he said with a laugh as he rolled underneath another blow and between that attacker’s legs. He stood up behind the man, locked his foot around the man’s leg, and pushed him forward into his compatriot. The two men collided and went down in a heap, leaving the entire group of bandits strewn about the corridor nursing sore wrists and bruised heads. I had never seen anyone handle so many attackers at once, much less with such grace and economy of movement. It was amazing and I told Tumble as much when he walked over to me. “We’s just looking to share some of your food, you little bugger,” growled one of the other bandits. “Yeah, by trying to kill us. C’mon, Tumble, let’s get out of here,” I urged him. Instead of leaving, though, Tumble had his backpack out from under his poncho. He pulled out hard rolls and fish jerky and set about distributing food to each of the men. “What are you doing?” I said in an aggrieved tone. The men, who just moments ago had been doing their level best to end our lives, seemed to be wondering the same thing as they sat up with Tumble’s gifts in their hands. One of them immediately began to eat the food he had been given, but Beak-nose lunged over and slapped the food into the man’s lap. “Did I mention you just tried to kill us?” I asked, but with none of the spirit I had put into my earlier pronouncements. I sensed something sincere in Ballister’s speech, and when I gripped his hand, his gap-toothed grin broadened. 10/14/12 News: The Only City Left is now listed on the Web Fiction Guide, a wonderful place to find all sorts of online fiction. If you are so inclined, I would appreciate any ratings/reviews/recommends on that site to help get TOCL noticed. Thanks! Logo Credit:The TOCL logo is courtesy of Jande Rowe of the webcomic Aedre’s Firefly. If you haven’t already read AF, I encourage you to go check it out. Not only does Jande produce the comic, she reviews other long-form webcomics, gives tips and instructions on creating a comic, and is endlessly supportive of other creators. For a great review that will bring you up to speed on Aedre’s Firefly, check out this page at Webcomic Alliance. I don’t know, I still wouldn’t trust those guys further than I could throw them – which in Tumble’s case, is pretty far. Yes, and that makes sense because Tumble is the more trusting of the two of them. Perhaps his influence is rubbing off on Allin. Thanks, Jande. I’m definitely trying to show that Allin is affected by his time with Tumble, and is acting differently than he would if he were alone, for good or ill.